Edna and Ernest Cooke. Undated photograph. Ernest "Ernie" Cooke (aka "Fat") was born June 17, 1919, in Castaic, to Mary Cooke (later known as Chief Mary Cooke Garcia) and was raised by his maternal grandparents, Chief Frances and Frederick S. "Fred" Cooke. As such, his ancestry is traceable to individuals who lived at Chaguayabit (aka Tsawayung), a Tataviam Indian village at Castaic Junction, prior to European contact in 1769. Ernie married Edna Louise Balsz (b. 9-16-1922, d. 9-25-2004), daughter of Bertolo "Bert" Balsz (rhymes with "waltz") and Belen "Minnie" Bindiola (Balsz). 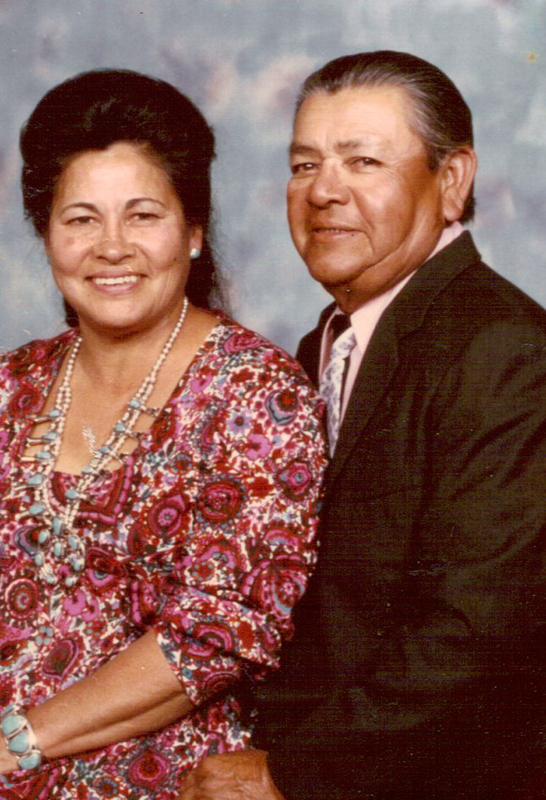 According to descendants, Bert (of German-Jewish and Chilean ancestry) and Minnie (Chiricahua Apache) came to Honby in the early 1930s and established an approx. 10-acre ranch bounded by Furnivall Avenue on the west, Honby Avenue on the east, Santa Clara Street on the north and Soledad Canyon Road on the south. They raised either eight or nine children there and conducted subsistence farming on the property, which was ultimately left to the children and sectioned off. Ernie and Edna lived in Newhall, where they raised three children: Ernestine Agnes (b. 7-15-1939 at Newhall Community Hospital); Susan; and Belen "Pinky" (b. 12-15-1950, d. 3-14-2007). Granddaughter Leticia Thomas, daughter of Ernestine, remembers (2014) that Grandpa Ernie "worked as a farm worker. When my mom was young, they traveled a lot. He also drove a truck, making deliveries to Bakersfield using the old Ridge Route. That trip was a layover because of it being only two lanes and windy." He would lay over in Arvin or Tejon, she said. According to daughter Ernestine (2014), Ernie Cooke also worked as a Hart High School bus driver for about a dozen years, from about 1957-58 until at least the fall of 1969. Leticia adds: "He took us kids to the dump when he did yard work and would salvage bicycles, wagons or other 'treasures.' My grandma hated us going but we loved it." Ernie Cooke died Jan. 3, 1982. He is buried in the Garden of Hope at Eternal Valley Cemetery in Newhall, where Edna and daughter Belen also rest. 1. Nanette Lagasse Gaither (2014): "Ernie Cooke was still driving for the William S. Hart district until at least the end of football season 1969. I graduated in June 1968, and Ernie was still driving then. He sighed my annual and those of so many of my fellow Hart students at the end of the school years. The football season that Fall, when my friends from Hart Class of '69 were attending football games, we used to meet them in whatever town they were in, and if Ernie was driving, we went to see him on the bus. Ernie had a way about him that made him perfect for driving around a bunch of teenagers. He was firm with us about what he expected from us on trips and let us know it at the beginning up front, but he was so nice about putting up with us, and I can still see his smile in the mirror when we were yelling for Hart's teams. I can't remember but a couple of times when Ernie had to stop the bus and remind someone of what he expected on his bus. He never yelled at us, but had a way of looking at the offender(s) that put them in their place in a nice way. ... Ernie was a great guy as are all of the Cooke and Baltz family members I have had the pleasure of knowing over the years." George Graves remembers (2014): Ernie also cooked the 4th of July barbecue for the Newhall Lions Club. He would bury the steer for days in a pit of HOT rocks. It was the best barbecue ever. It was also great to be friends with the family out at the ranch. LT0203: 19200 dpi jpeg from smaller jpeg courtesy of Leticia Thomas | Online image only.